Joining the therapy sessions at Pilgrims Hospices has made a remarkable difference to the life of Maureen Meltzer. With new-found confidence and new friends, she has been inspired to take on different interests and challenges to help her live well in every moment. Maureen was diagnosed with breast cancer and knows her symptoms will not improve. Pilgrims are helping her to embrace the chance to make every moment count. Maureen’s GP made the referral to Pilgrims in order to help meet her individual needs and assist in getting the right support to maintain her wellbeing at home. I knew nothing about hospice services prior to attending Pilgrims, it was a big step to take and I’m so glad I made it. Maureen from Faversham is 72 and attends the therapy sessions at Pilgrims Hospice Canterbury day services: “When I was offered the opportunity to get involved, I initially thought I don’t need any therapy? However, after some thought, I said, ‘I’ve nothing to lose’, and read through the booklet and discovered much more than I had imagined. “Being quite a private person, I never thought I would enjoy coming to the support sessions. I’ve been attending on Mondays for about 6 weeks and really look forward to meeting everyone at the group. I now thoroughly enjoy the company of others and the atmosphere is so relaxed and the staff are very knowledgeable and caring. I feel like I’m amongst friends.” Maureen added. I now thoroughly enjoy the company of others and the atmosphere is so relaxed and the staff are very knowledgeable and caring. I feel like I’m amongst friends. Maureen explained: “I knew nothing about hospice services prior to attending Pilgrims, it was a big step to take and I’m so glad that I made it. I’m not treated as though I’m fragile because of my illness, I’m treated as an individual. 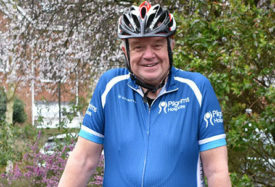 “I don’t know what’s around the corner but Pilgrims most certainly has helped me to think positively about my wellbeing and keeps me motivated not to give in. 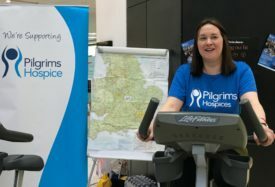 Each year Pilgrims Hospices give care and comfort to more than 2,300 people in east Kent coming to terms with an illness that sadly cannot be cured. The charity support patients to live life as well as possible until the very end, free from pain and distress.